Despite its decent start, March ended up being another bad month for the market. The S&P 500 lost 2.7% of its value last month, defying the odds in doing so; the index gains an average of half a percent in the month that just ended. April is supposed to be just as fruitful, if not more so, as the S&P 500 averages a 1.2% advance this month. It remains to be seen if this April will unfurl as history suggests. With two losing months in a row forcing investors to rethink just how strong the market may or may not be, anything is possible. Whatever’s in the cards for the broad market though, there are a handful of individual stocks that should do will this month no matter what. Either timing, or news, or a combination of both have set a bullish stage. Here’s a closer look at the market’s top ten bets for this month, and in some cases, beyond April. 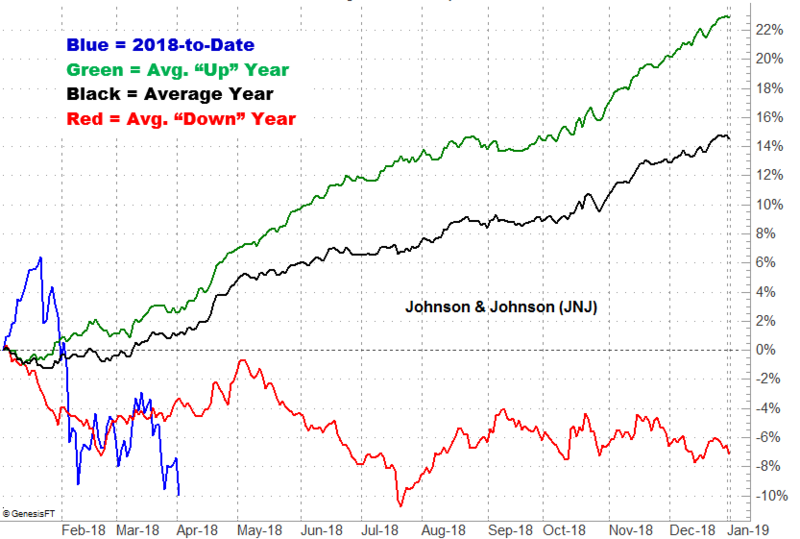 A quick scour of the recent headlines could be a little concerning for current or potential Johnson & Johnson (NYSE:JNJ) shareholders. The company is being sued by multiple parties — a class action suit — for making opioids and then downplaying their dangers and addiction risks. The plaintiffs don’t have a great legal argument though. J&J has survived better cases, even if the headlines themselves incite a little fear. The fear-inspired weakness seen over the course of the past few weeks, though, may actually be a setup for an even better-than-usual April. The stock, on average, gains 4% this month, and manages to do well in April even in a “bad” year. 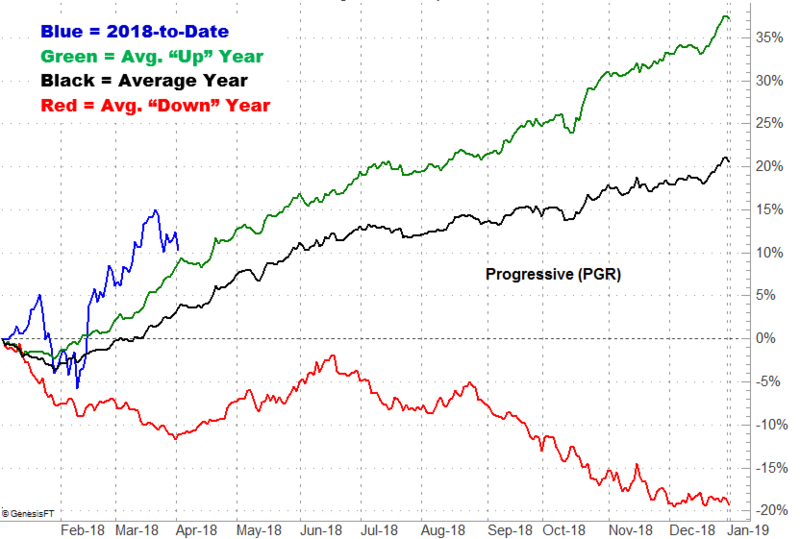 Shares of insurer Progressive Corp (NYSE:PGR) have been on fire of late, but deservedly so. They’ve gained more than 12% since the end of last year, and continue to reach for higher highs as the market celebrates February’s great results (yes, the company shares monthly revenue data). Premiums collected in February were up 23%, and the number of active policies was up by double digits. The results extend a long-standing streak of forward … ehhh, progress. Thing is, PGR stock is no stranger to gains, before and after April. Shares tend to rally nicely through the first half of the year, and even in a down year, April and May tend to be good months. May 1 could be a make-or-break day for shares of water-management technology company Ecolab Inc. (NYSE:ECL). That’s when it’s going to post its fiscal first quarter results. If they’re anything like Q4’s results, the market will have something to cheer about. Although the company missed its earnings estimate for the fourth quarter, per-share profits grew from $1.25 to $1.39, and sales were up a little more than 7% on a year-over-year basis. The outfit is capitalizing on a shockingly understated looming water crisis, and it presents a big opportunity for investors. 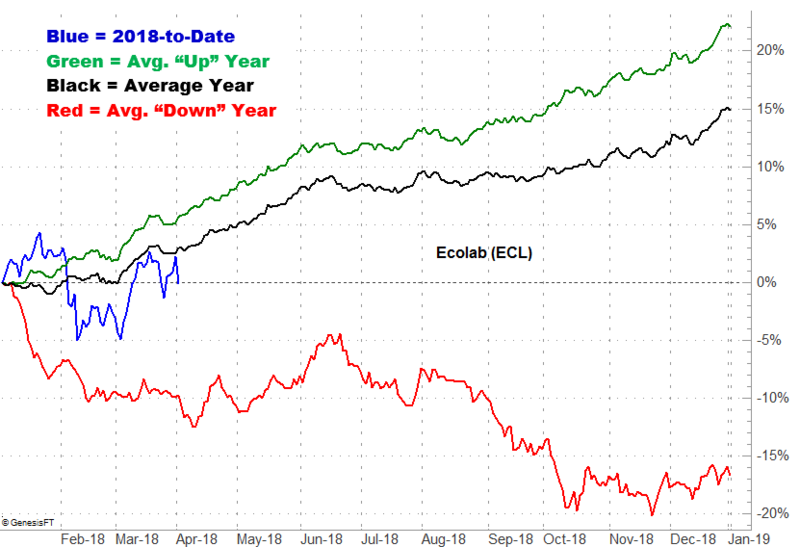 Springtime is also an unusually bullish period for ECL stock. Shares advance a typical 2.4% in April, and that trend tends to last past May … even in “bad” years. 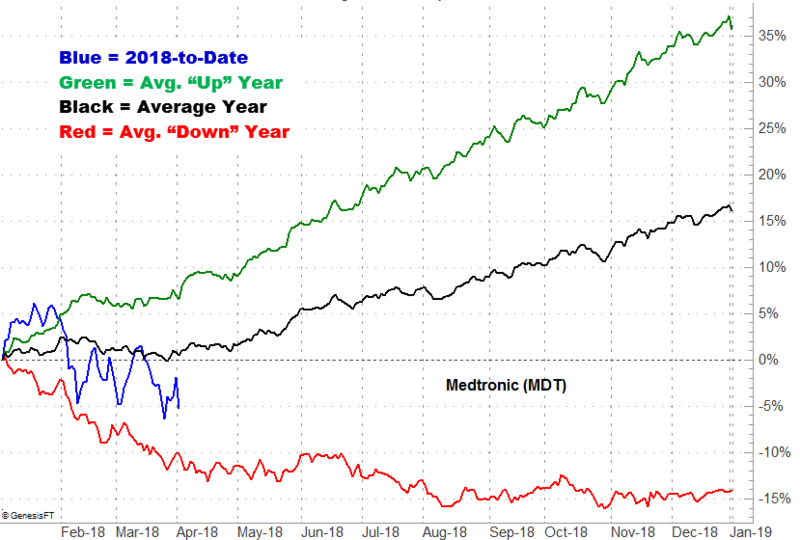 February and March tend to be tough months for Medtronic PLC (NYSE:MDT). That weakness is usually put in the past by April though, setting the stage for a strangely steady march higher over the course of the rest of the year. Even in a down year, MDT manages to hold its ground despite a rough start. This year hasn’t been a great one thus far. MDT shares are in the hole to the tune of 6%, despite compelling headlines. It Guardian Connect continuous glucose monitoring (CGM) system got the green light from the FDA, and its experimental AdaptivCRT (cardiac resynchronization therapy) technology appears to be working quite nicely. It’s just not been enough. The stock’s weakness may be more about the environment and less about the company, however. Once investors look past the fog of uncertainty, they could easily argue the forward-looking P/E of 15 makes MDT a bargain. Thermo Fisher Scientific Inc. (NYSE:TMO) makes a variety of scientific equipment, particularly for the healthcare industry (including an array of developmental tools for the pharmaceutical field) as well as for computer technology outfits. Its Verios G4 extreme high-resolution (XHR) scanning electron microscope, for instance, allows semiconductor companies to look at their products in a detail they simply can’t see with the naked eye. 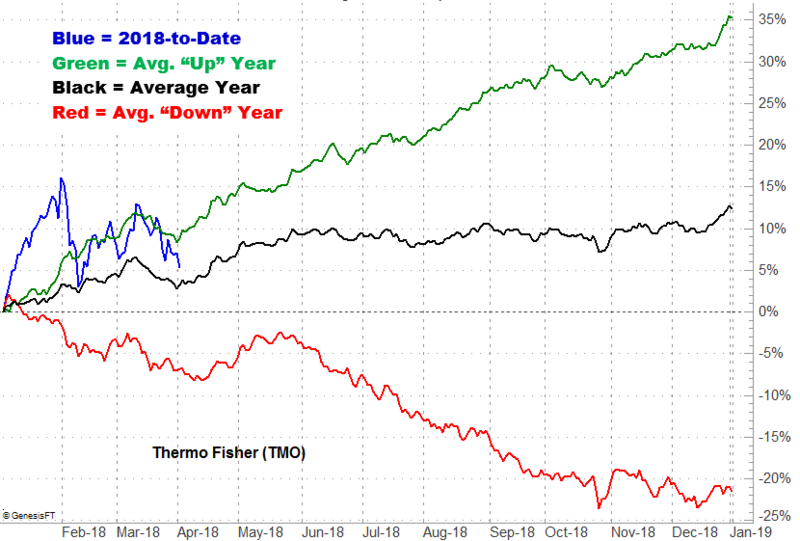 Almost needless to say, when the pharma and semi industries are doing well, Thermo Fisher is too. Well, despite the recent market weakness, pharmaceutical and technology companies are thriving, spurring a 22% increase in Q4’s top line. Earnings were up 15%. Granted, much of Thermo Fisher Scientific’s recent success stems from acquisitions. Few other companies extract as much value from deal-making as this one does though, bolstering the case for the stock’s usual April/May strength … strength that could persist for the rest of the year, if history is any indication. You know the funny-named company, even if you don’t think you do. Mondelez International Inc (NASDAQ:MDLZ) is the parent to brands of familiar consumer products like Oreo, Ritz crackers, Dentyne gum and more. Mondelez is particularly vulnerable to a trade war, in that roughly three-fourths of its revenue is generated outside of North America. While China’s newly-announced tariffs on goods shipped into the country didn’t directly impact Mondelez International, they got dangerously close. Fruits, nuts and wines were on the new-levy list, and before all is said and done snacks imported from a variety of countries could be targeted. The pullback from the January high, however, may be pricing in more trade war fear than is necessary. 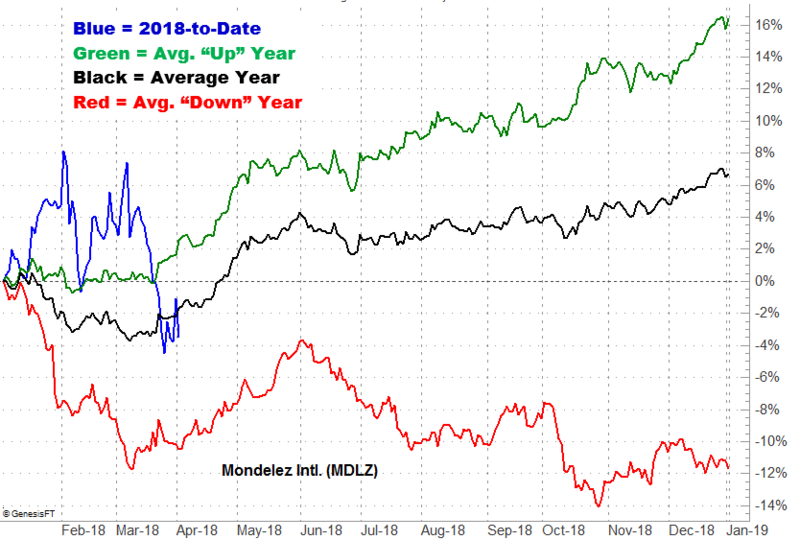 Realizing they’ve overdone it, the recent sellers may change their mind and spur the usual 4% gain we see from MDLZ this month. Ford Motor Company (NYSE:F) is yet another American company that’s been erroneously lumped into the list of potential trade war victims. Sure, Ford needs China, and many other countries to buy its cars. It’s already paying a 25% tariff to import cars into China though, and when all is said and done, less than one-fifth of all the vehicles it makes are sold in China, and not all of them are actually imported. In other words, a trade war with China isn’t necessarily the end of the world. The biggest risk to Ford is more expensive imports of steel and auto components. Even then though, the risk is fuzzy, at best. It’s a detail that should start to circulate once the initial dust from the alarming trade-war headlines settle. 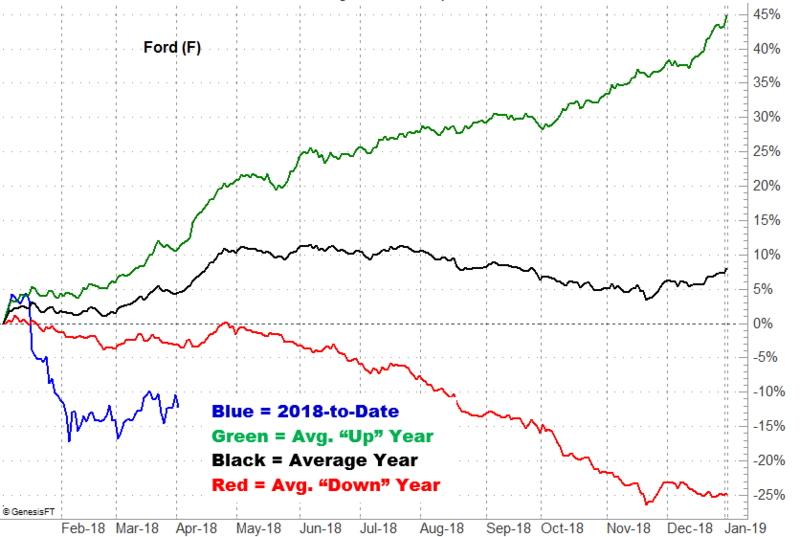 As it does, don’t be shocked if Ford shares turn the heat up on the rebound they’re already working on and dish out their usual April strength. It’s not entirely clear why, but, weapons and military technology stocks tend to perform very well in April, and that strength usually lingers through summer. 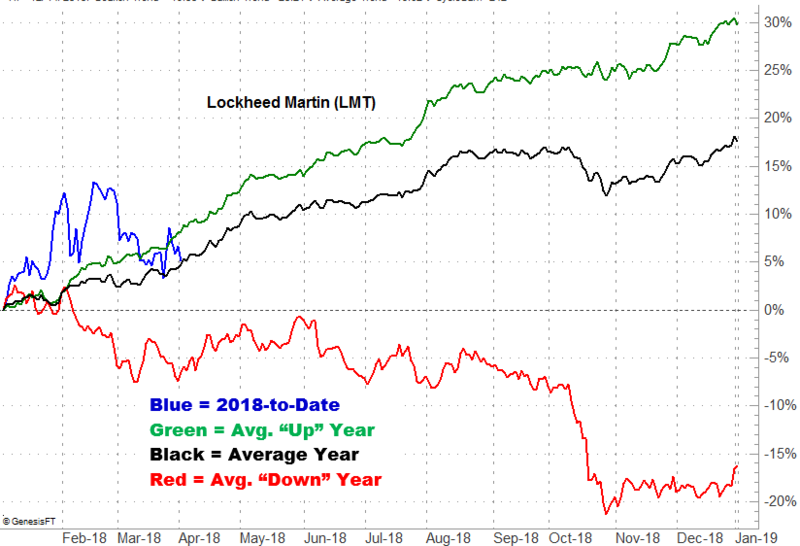 Lockheed Martin Corporation (NYSE:LMT) is no exception to this trend, averaging almost a 5% gain in this month alone. Yes, Lockheed Martin is the maker of the F-35 fighter jet, which has been plagued with complaints about its costs, maintenance, and the sheer lack of them thus far; the organization is way behind its original production schedule. It just doesn’t matter. The Department of Defense and other key government officials are committed to it, in the absence of alternatives. In the meantime, a record-breaking defense budget for the year ahead is going to be all but impossible for investors to ignore. AbbVie Inc (NYSE:ABBV) may have got the year started with a bullish bang, but that all unraveled last month. The stock fell nearly 25% after the company announced a lung cancer drug it had been developing failed to meets its goal in mid-stage trials. Porges also described the selloff as “excessive” though, implying the stock could turn around sooner than later. A bounce would certainly be in line with the stock’s historical results. 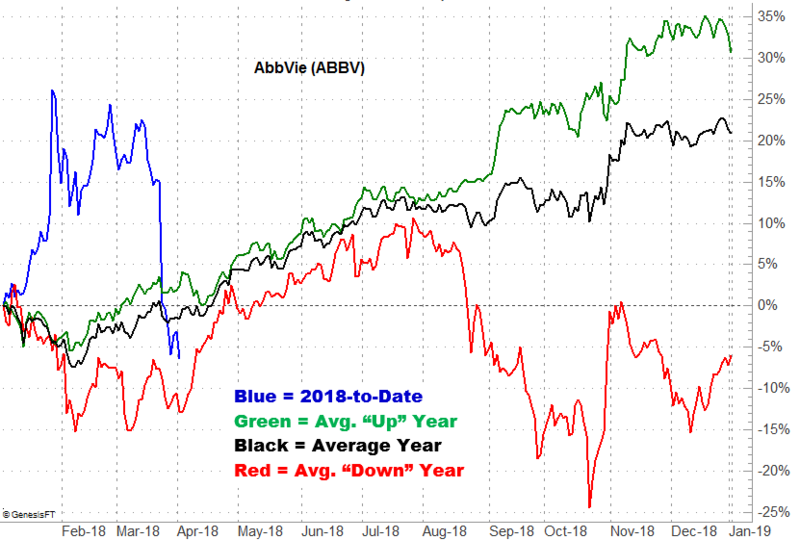 In good times or bad, ABBV shares start a nice bullish run in March that lasts all the way through June. Last but not least, Yum! 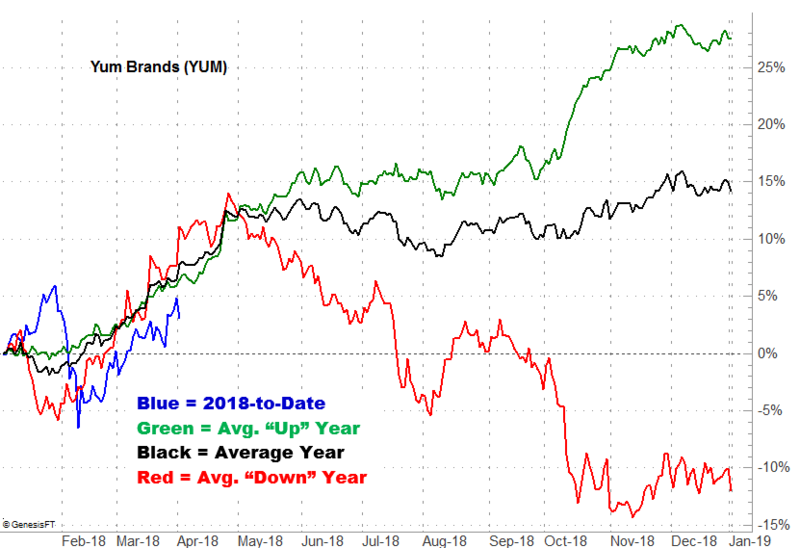 Brands, Inc. (NYSE:YUM) — the parent of KFC, Taco Bell and Pizza Hut — usually dishes out a big helping of bullishness in April, gaining an average of nearly 6%. This time around doesn’t look like it’ll be any different, given the stock’s current trajectory. It has been a tricky but tough past few months for the company. Though it’s putting Taco Bell branded tortilla chips in grocery stores and its limited-time nacho fries proved to be a huge draw to its Taco Bell units, during the fourth quarter, earnings topped expectations while revenue fell short. Since then, its UK-based KFCs suffered a chicken shortage. All seems to be stabilizing now, but don’t turn your back on YUM shares. While April is usually a great month for the stock, things change in a hurry once May arrives. Article printed from InvestorPlace Media, https://investorplace.com/2018/04/2018-10-best-stocks-buy-april/.